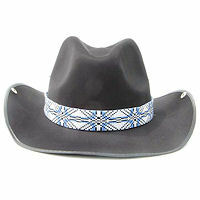 This beaded hat band is black, blue and white. It is 43" (109.22cm) in length overall, including the leather ties, and 1" (2.54 cm) wide. The beaded part is 19" long (48.26 cm). It will fit up to a 40" waist if worn as a belt, or just cut the ties to fit any hat.